Feb14 Comments Off on What Does It Cost to be an Olympian? What Does It Cost to be an Olympian? Anyone who’s been watching the Olympics knows from endless P&G “Thank You, Mom” commercials that it takes an incredible amount of talent, parental support, time, hard work and dedication to make it to the Olympic Games. But what we tend to forget is that the cost of actually getting to the Games can be exponential. For many young athletes, their parents finance their children’s coaching, equipment, training facilities and travel expenses to various competitions around the world. 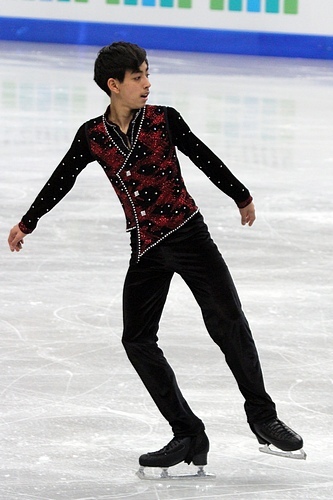 17-year-old figure skater Michael Christian Martinez, the only athlete representing the Philippines in the 2014 Sochi Winter Olympic Games, is a prime example. In an interview, his mother Maria Theresa Martinez revealed that the family had to mortgage their house in order to send Martinez all the way to Sochi. She had allegedly written to Filipino President Benigno Aquino III asking for financial support but had not received a response and was forced to mortgage their house. His tale is an inspirational one, for sure. Martinez first began skating at the age of eight, despite having had asthma attacks from dabbling in other sports, and often had to train in skating rinks inside shopping malls. The Philippines has never before medaled in the Winter Games, but on Feb. 13 Martinez qualified in the men’s short program to compete in the free skate program, making him eligible to contend for a medal and make history. The Martinez family isn’t the only one to have suffered financially from sending their young athletes to the Olympics. The families of U.S. gold medalists Gabby Douglas (gymnastics) and Ryan Lochte (swimming), two stars of the London 2012 Olympics, have also filed for bankruptcy and faced foreclosure, respectively. Though Douglas and Lochte are now both earning enough to fund their own training expenses through endorsements and other deals from sponsors, there is no doubt that their parents had to have sacrificed plenty of money along the way to even get them to reach the high levels they are currently at in their athletic careers. It’s easy to get caught up in the glamour and prestige of the Olympics and even feel inspired from Proctor & Gamble’s heartwarming “Raising an Olympian” series, but we often forget about how much parents really have to give up in order to support their children. It takes much more than encouragement from mom and dad and a tough mindset with the determination to make it. Hopefully these successful Olympians are finding ways to give back to their families for all their years of support.